But I just can't stop. I adore every single, itty, bitty inch of this space. So much so, that I can't seem to peel my eyes away. That is gorgeous! 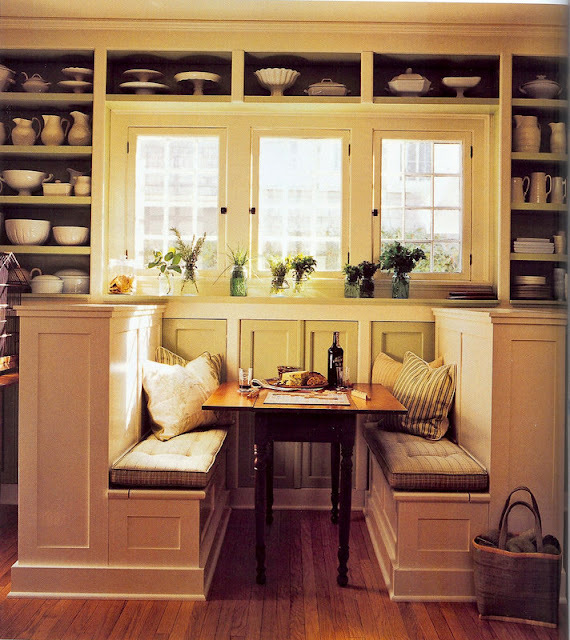 I am a total build-in freak- if banquette seating would work in my kitchen, I would totally have it! I'm also lucky to have a Daddy who is a custom cabinet builder so when I say "I would have it", I absolutely would! Gorgeous! I also love the white dishes but I know that would NEVER look good in my house as it would never stay that perfectly organized. We had a banquet in our last home and it was so much fun. Part of me has be thinking about Ballard Designs movable banquet couch..a girl can dream. No wonder you can't stop staring at it, it's gorgeous! That is so pretty and looks really comfy too! Such a gorgeous and cozy space!!! Love it! Oh that IS pretty! Are those cabinet doors at the end of the table? (like for more storage?) And I love those little windows! Tessa - I found this photo is in the MSliving "organizing" issue last week... I put it up on my inspiration board in my new office... we must be sisters from another life! Very pretty! 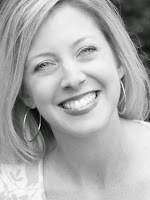 Just found your lovely blog via Carolyn's. I saw your dining room and had to hop over here. It's gorgeous. Couldn't believe you hadn't pinned your own dining room so I did it for you! ;) Happy to be following.